To mark the fifth anniversary of the Australian Armour and Artillery Museum opening, and to celebrate Fathers Day 2019, we will be holding our fourth AusArmourfest event on Saturday 31st of August and Sunday 1st of September. 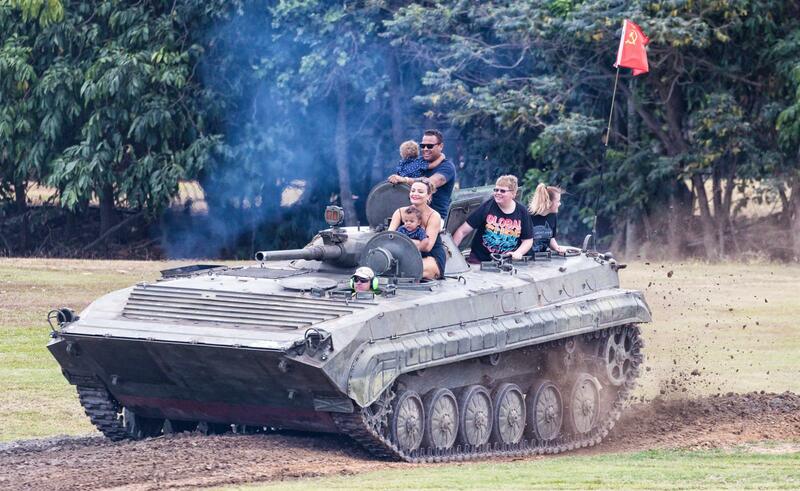 This event will feature over a dozen historic vehicles driving on the museum grounds with the opportunity for visitors to purchase tickets to ride in them and experience ‘Combat Conditions’! It is important that everyone knows that in these vehicles you will experience ‘Combat Conditions‘ as the vehicles have very little room inside them. This can be very uncomfortable for some and not an appropriate option for claustrophobic people. Vehicles marked with a * are those which have very little room to move around in. If you have any further questions relating to the vehicle conditions and requirements please call the Museum on 07 4038 1665. Please note that vehicles for 2019 will be confirmed closer to the event. Tickets for rides are only available for purchase on the 31st August / 1st September at AusArmourfest. One ticket entitles you to one ride in a vehicle of your choice within the chosen tier. Please note that during AusArmourfest some of the museums regular activities will be unavailable. Our daily APC rides will not be operating and our Shooting Gallery will be closed for the 2 days.